Address: Avenida de las Playas, s/n, Puerto del Carmen (Lanzarote), Islas Canarias. 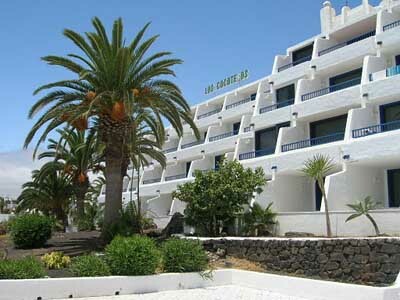 Los Cocoteros is located on the beachfront in Lanzarote’s Puerto del Carmen resort. It offers an outdoor pool and beach-style apartments with a private terrace. The apartments at Los Cocoteros feature 1 twin bedroom, a bathroom with combined bath tub and shower, and a spacious living-dining area. The kitchenette opens out onto the living room and includes a fridge and microwave. Located on Las Playas Avenue, the complex is surrounded by shops, restaurants and bars. Timanfaya Nature Reserve is a 25-minute drive away, and you can drive to Lanzarote Airport in around 10 minutes. Please inform Labranda Los Cocoteros in advance of your expected arrival time. You can use the Special Requests box when booking, or contact the property directly with the contact details provided in your confirmation. Reception opening hours are from 08:00 until 00:00.